floatingsheep: New paper accepted in Landscape and Urban Planning! New paper accepted in Landscape and Urban Planning! We're very happy to announce that three-fifths of the collective have recently had a new paper accepted for publication in the journal Landscape and Urban Planning, as part of a special issue on critical visualization edited by Annette Kim, Katherine Foo, Emily Gallagher and Ian Bishop. Taylor, Ate and Matt's paper, "Social media and the city: rethinking urban socio-spatial inequality using user-generated geographic information", builds on our earlier calls to go 'beyond the geotag' in order to develop alternative conceptual and methodological approaches for the use of geotagged social media data, drawing attention to the variety and complexity of socio-spatial processes embedded in such data. 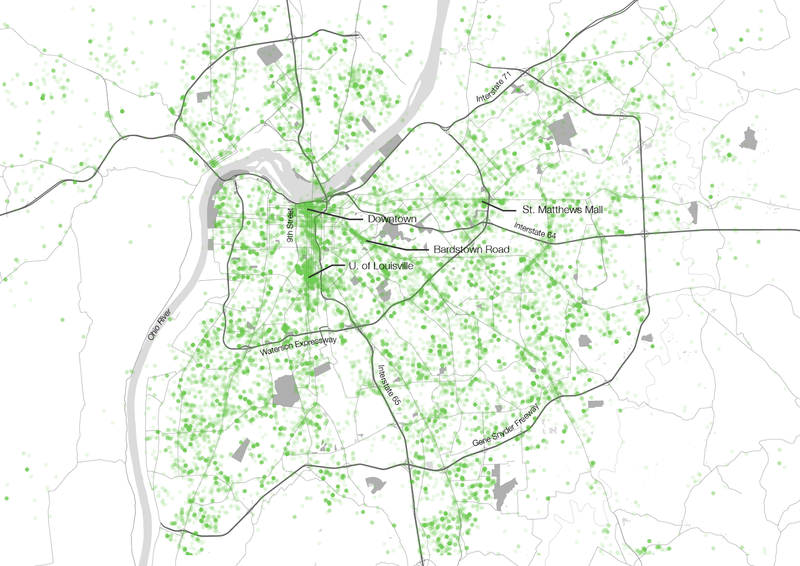 Using Louisville, Kentucky as a case study, our paper examines the socio-spatial imaginary of the '9th Street Divide', separating the city's largely poor and African-American West End from its more affluent and predominantly white areas to the east. While a more conventional analysis of these inequalities as reflected in geotagged tweets might look a bit like the map above, we argue that such maps of isolated, atomistic dots do little to reveal the nature of inequality between places, and do a disservice to the data itself by stripping it of much of its context. So, rather than just arguing that the West End seems to have a relative lack of tweeting activity compared to other parts of the city -- and thus deducing that the digital divide is persistently reflected in this data -- we put these different areas of the city in comparison to one another in order to understand how both individuals and groups move through the city and (re)produce landscapes of segregation and inequality through their everyday practices and mobilities. Using a novel method for analyzing this data, we attempt to demonstrate how the idea of the West End as a separate and apart from the rest of the city is challenged by the realities of people's everyday movements. Rather than being isolated, West End residents are actually much more spatially mobile within the city, while East End residents tend to be much more confined to their own neighborhoods. 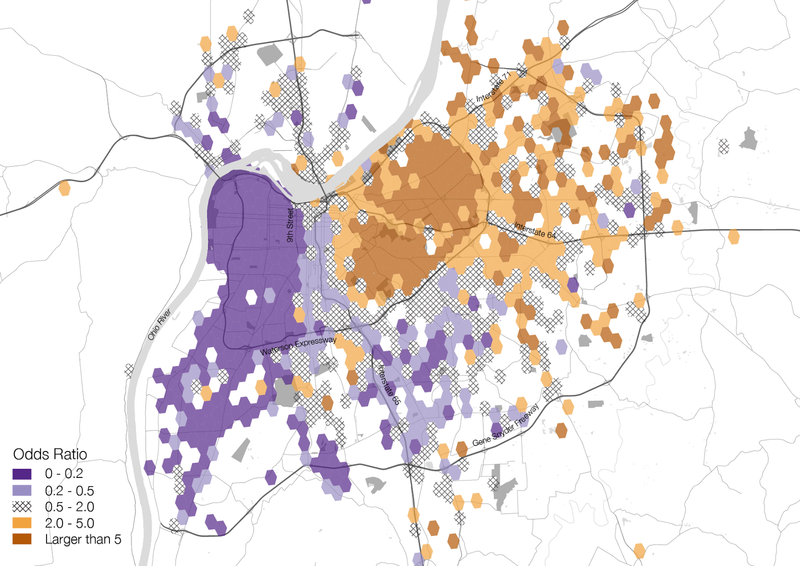 So while the 9th Street Divide remains a key way of understanding and highlighting the spatial dimension of urban inequality in Louisville, we tend to think that this framing actually reinforces the understanding of the West End as a kind of 'problem area'. And while only a partial contribution to this argument, we hope that understanding the West End through its relations with, and connections to, other spaces and places ameliorates the vilification and pathologizing that is so common in discussion of racial and socio-economic inequality in highly segregated cities. Ultimately, we hope this paper can allow for an alternative conceptualization of urban inequality in Louisville and the West End, while also demonstrating the utility of a situated and contextualized, mixed methods approach to the study of geotagged social media data, emphasizing the full range of socio-spatial processes embedded in this data that can't be captured in just a single point on a map. Shelton, Taylor, Ate Poorthuis, and Matthew Zook. (Forthcoming) Social media and the city: rethinking urban socio-spatial inequality using user-generated geographic information. Landscape and Urban Planning.